It's Festival season my loves! Which means fun outfits, creative makeup looks, and hairstyles galore! Putting these looks together in your head is the easy part, but actually creating a look that will last all day long in the elements is a whole other story! Luckily Pantene has created the PERECT kit filled with all your festival hair essentials to ensure that your hair is at it's best before, during, and after all your festival festivities! Today I am going in depth and showing you all the products included in this trendy kit! 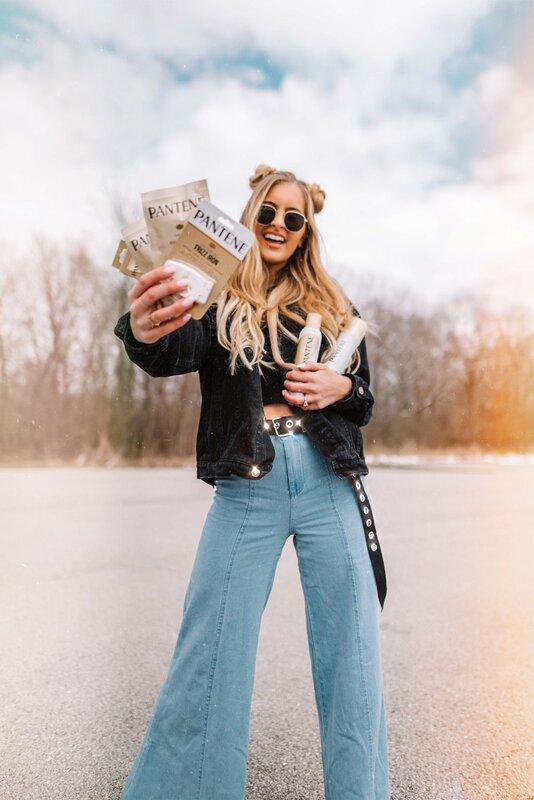 Each one can be used to enhance your hair look and ensure your hair is always at it's best at Coachella or any music festival you may attend! Let's jump in! 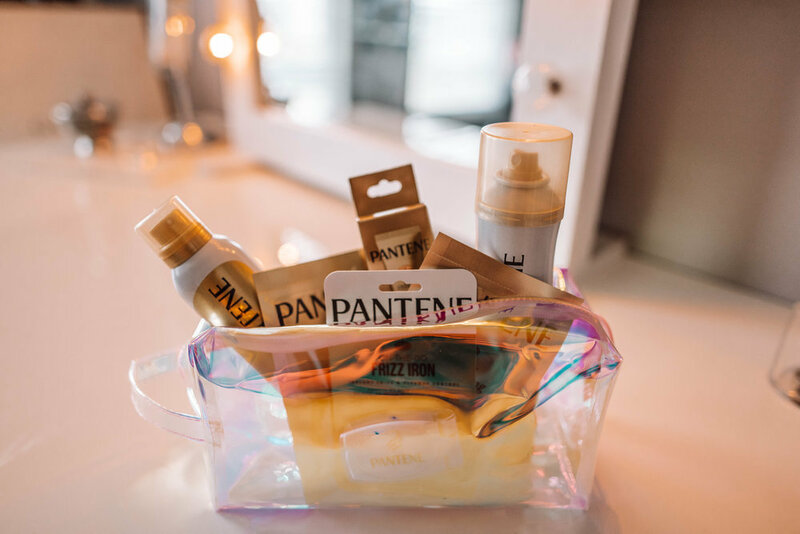 The Pantene Festival Hair Kit includes a full sized bottle of Airspray, a full sized bottle of Dry Shampoo, a Frizz Iron, 2 Nourishing Masks, and Intense Rescue Shots all packaged up in the cutest translucent travel case! Everyone knows how essential Dry Shampoo is. Use this product to add texture and volume pre festival or use it to revamp your hair even on the second or third day! Festivals are typically hot and sweaty so dry shampoo is a total must!! This nifty product controls frizz and fly-aways without use water or heat! It is the perfect product to keep your mane tame through even the worst festival humidity! 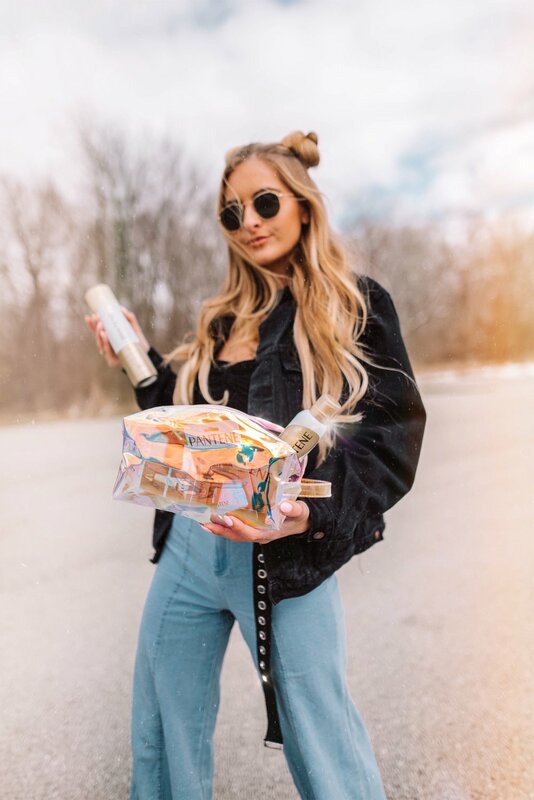 Not only does the Airspray act as a hairspray by providing a strong hold, but it also locks out humidity, adds shine, and controls frizz. This can be used to set your look in place before you head and can also be used to touch up throughout the day! When all the fun is over and these rescue shots are here to save your hair from the damage it may have inquired during the day. This product can repair extreme damage in just one single use. It is currently the #1 selling NEW treatment item across the haircare category! Festivals can dry out hair to the extreme, these masks come in handy to restore the moisture back into your hair! I put these products to the test and created one of my favorite hairstyles perfect for festival season! I am not lying when I tell you this kit is a gold mine! 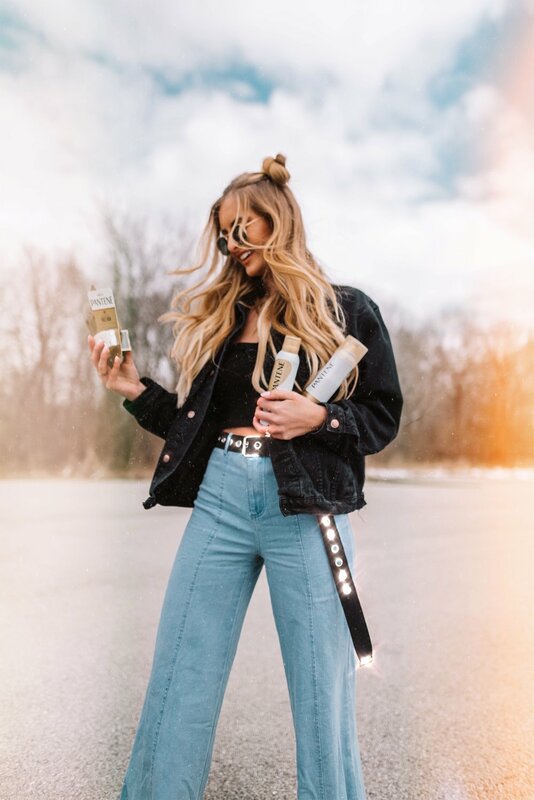 Not only will this kit help prepare your hair for the day and maintain your look, but it also won't leave your hair behind when all is said and done! Many festival looks can cause serious damage to your hair if you are not careful! Cute hairstyles such as tight braids can leave your hair broken and damaged. This kit has everything you need to get your hair in even better shape when the festival is over! Here are some of the fun photos I shot that I thought I would share! 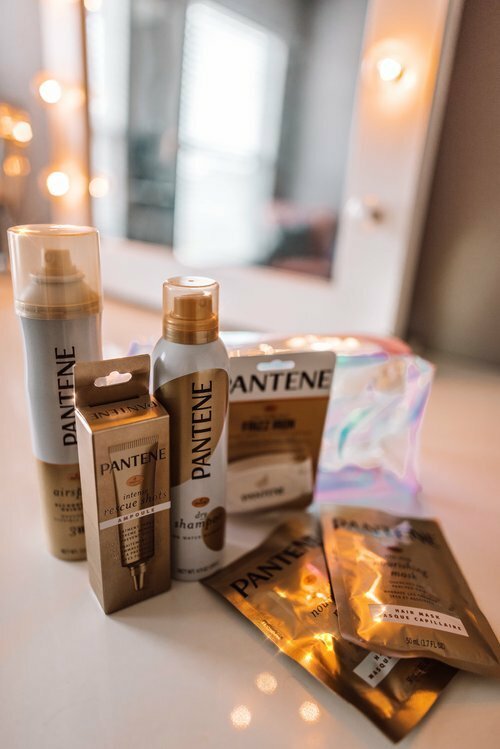 I hope you guys loved hearing about Pantene's Festival Hair Kit! If you'll be attending a festival in the near future I highly recommend picking up this kit, it will save your life! It’s Festival season my loves! Which means fun outfits, creative makeup looks, and hairstyles galore! 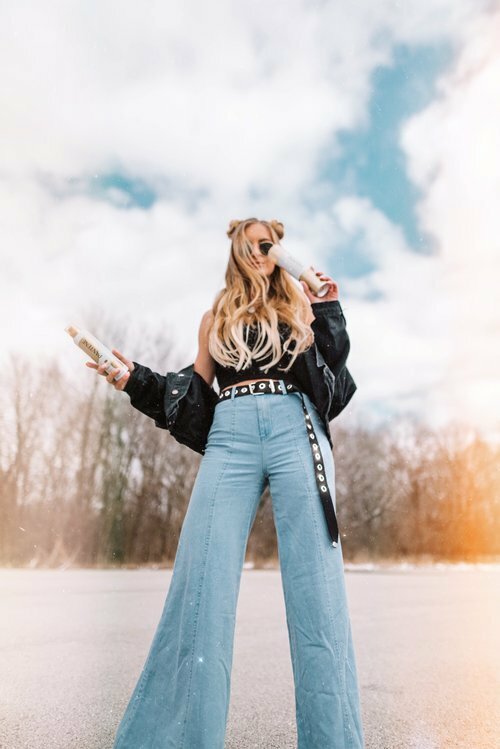 Putting these looks together in your head is the easy part, but actually creating a look that will last all day long in the elements is a whole other story! 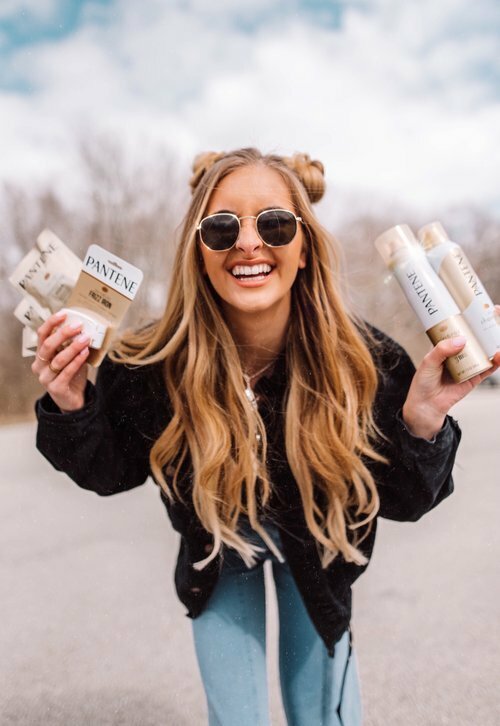 Luckily, Pantene is the official haircare sponsor of Coachella, Stagecoach and Firefly, and has created the PERECT portable Festival Hair Kit filled with all your festival hair essentials to ensure that your hair is at it's best before, during, and after all your festival festivities! Today I am going in-depth and showing you all the products included in this limited-edition, trendy kit! 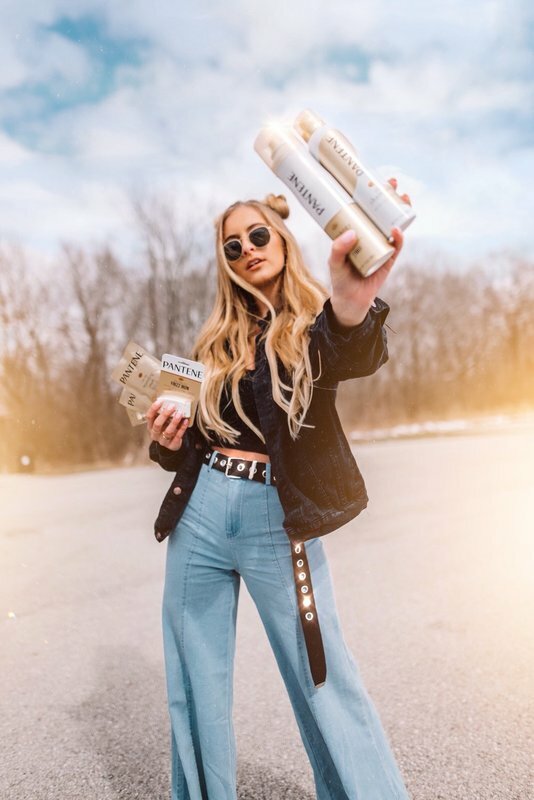 Each product can be used at various times throughout the festival weekend to enhance your hair look and ensure your hair is always at it's best at Coachella or any music festival you may attend! Let's jump in! The limited-edition Pantene Festival Hair Kit includes a full-sized bottle of Airspray (alcohol-free hairspray), a full-sized bottle of Dry Shampoo, On-the-Goa Frizz Iron, 2 Nourishing Masks sachets, and one ampoule of the Intense Rescue Shots all packaged up in the cutest translucent travel case! Everyone knows how essential Dry Shampoo is. Use this product to add texture and volume pre-festival or use it to revamp your hair even on the second or third day! Festivals are typically hot and sweaty so dry shampoo is a total must!! Just shake, spray at the roots or wherever your hair needs some refreshment and rub into your hair. Easily remove excess powder with the swipe of a brush! 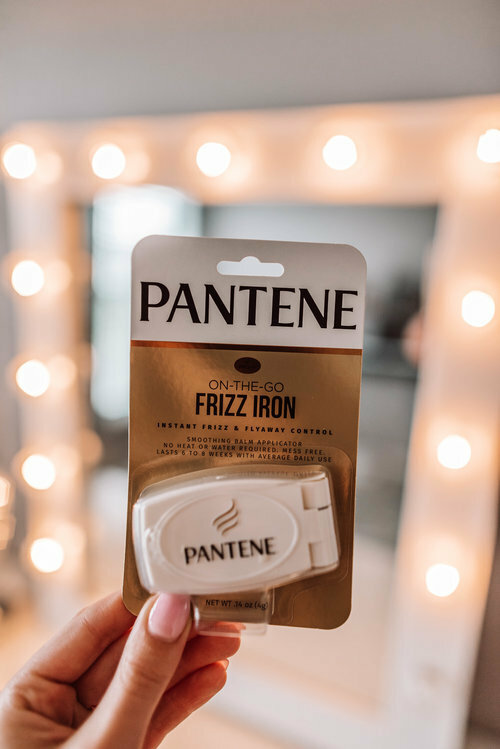 This nifty product controls frizz and fly-aways without using water or heat! It is the perfect product to keep your mane tame through even the worst festival humidity! Clamp the Frizz Iron around your hair and glide it from top to bottom. 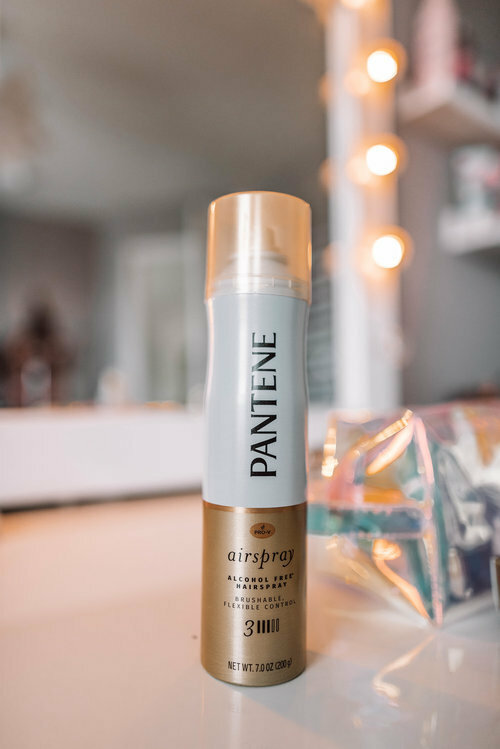 Not only does Pantene’s Airspray act as a hairspray by providing a strong hold, but it also locks out humidity, adds shine, and controls frizz. This can be used to set your look in place before you head out and can also be used to touch up throughout the day! Oh, and did I mention it’s alcohol-free? 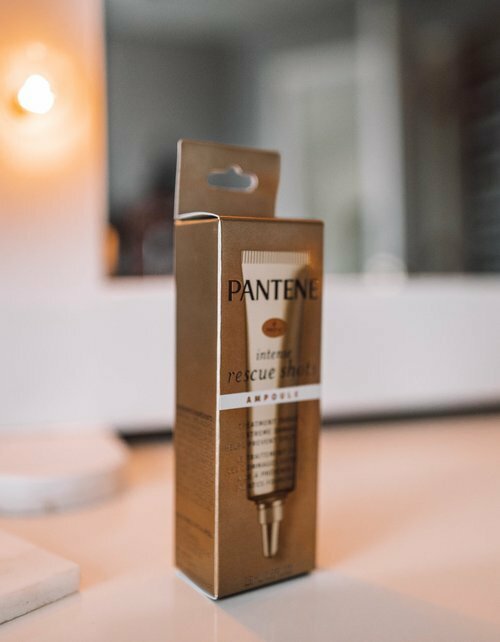 When all the fun is over, the Intense Rescue Shots are here to save your hair from the damage it may have acquired during the day. After washing your hair with shampoo, apply onto damp hair, massaging from root to tip, targeting areas that see the most damage. Leave in for 30 seconds, then rinse for 30 seconds. This product can repair extreme damage in just one single use. It is currently the #1 selling NEW treatment item across the haircare category! 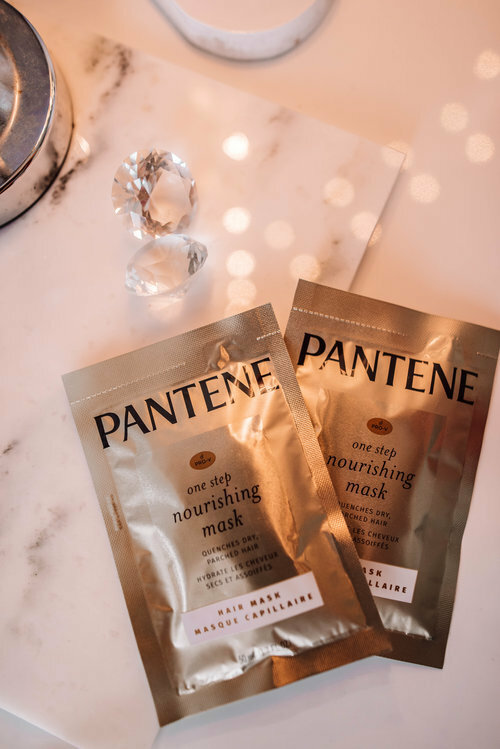 Festivals can dry out hair to the extreme, these Nourishing Mask Sachets come in handy to restore the moisture back into your hair! The result is healthier, shinier and stronger hair! While in the shower, after shampooing, place a half dollar amount into your hands and comb mask into your hair from mid-shaft to the ends. Leave in for for 5-7 minutes or longer if desired. Rinse thoroughly after use. I put these products to the test and created one of my favorite hairstyles perfect for festival season! 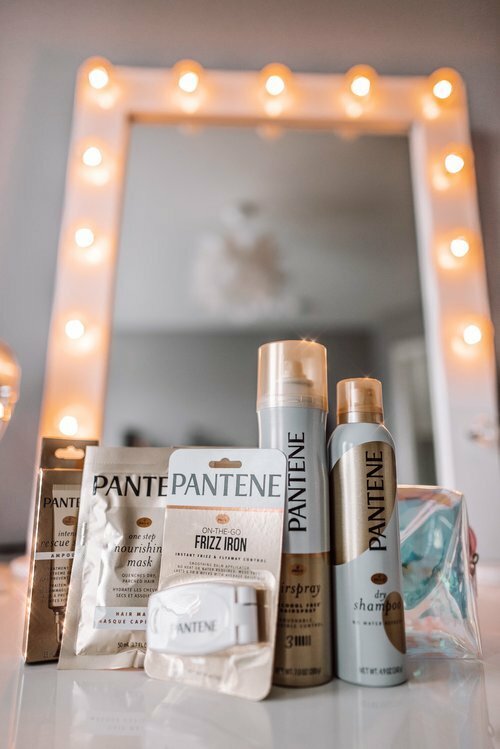 I am not lying when I tell you Pantene’s Festival Hair Kit is a gold mine! Not only will this kit help prepare your hair for the day and maintain your look, but it also won't leave your hair behind when all is said and done! Many festival looks can cause serious damage to your hair if you are not careful! Cute hairstyles such as tight braids can leave your hair broken and damaged. This kit has everything you need to get your hair in even better shape when the festival is over! 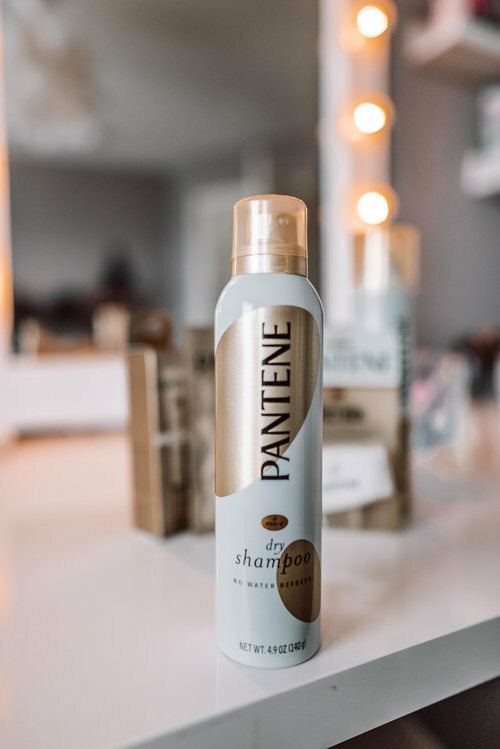 I hope you guys loved reading about Pantene's Festival Hair Kit! If you'll be attending a festival in the near future I highly recommend picking up this kit on Amazon (it’s also available for Prime Shipping), it will save your life!